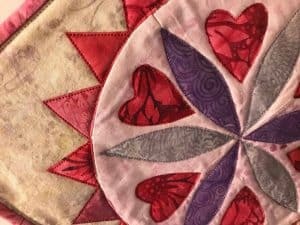 If its September is means its time for the Bloggers Quilt Festival at Amy’s Creative Side. This is one of my favorites that I made this year. It was for an Island Batik Ambassador challenge called Mini-Love and they provided the fabric. 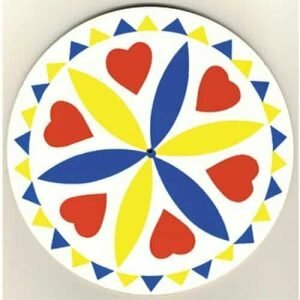 Amish hex signs have always intrigued me. I grew up in Pennsylvania, Berks County, and they were abundant. My only problem was that the colors were never my favorite so changing it up was what I did. 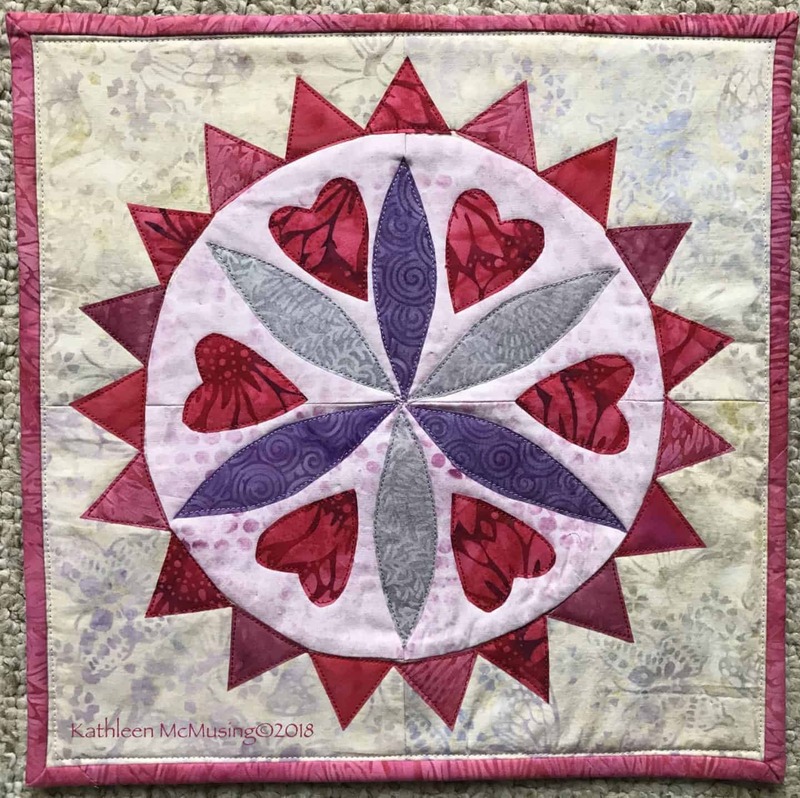 It was one of the first quilts I designed in EQ8; I had done a few before but in EQ7 but hadn’t really learned the upgraded version. I was glad I did as it made checking out my vision easier than drawing. 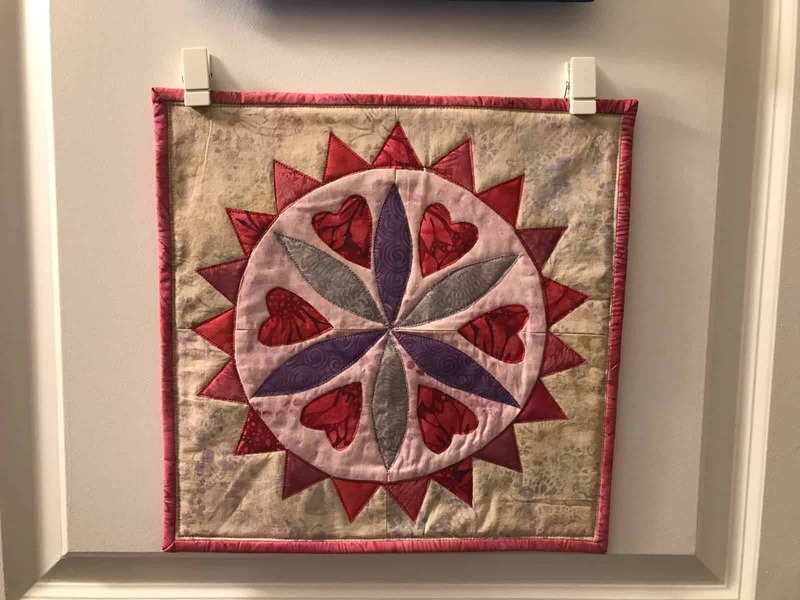 This quilt hangs in my sewing studio in our apartment. I really love looking at it each day. The original post has some information on how to make it and one day it may be a pattern! Do check out the other entries & thanks for stopping by! I remember this little quilt, Kathleen. I love it! It’s fun to get to go back and share favorite finishes for the festival. I love how happy this one is! Thanks, Yvonne, it is one of my current favorites. Such a beautiful little quilt. I am so glad you liked it. Thank you for stopping by! Cute colors, Kathleen! That regional folk art is the original barn quilts. Of course! I never thought of that even though I saw those hex signs all the time. Thank you so much, Sandra. It is fun and I think there will be a series in my future! Thanks, Wendy. Working my way back in – one more event a then a little peace.